This is the first of two posts about an IOT Bitcoin vending machine I built while interning at NetBurner. Part 2 is more technical. Bitcoin is cool. It’s also kind of absurd – based on impossibly complex cryptography and hyped by libertarians and Reddit anarcho-capitalists, the technology seems destined either to radically change our concepts of value and trust or to languish as a “magic internet currency” for nerds and drug dealers. Part of the problem is that acquiring bitcoins remains a daunting process; not only for the “average person” (the mythical grandmother who would totally use bitcoin) but for anyone who just wants to play with the technology. My understanding of the blockchain doesn’t help me use poorly designed wallet software, and it certainly doesn’t make IRL bitcoin deals feel less sketchy. The Bitcoin vending machine (or “ATM,” if you’re a startup with no integrity) was supposed to address this issue drive to an inviting and well-lit monolith, insert cash, and receive bitcoin. Simple. Well, maybe if you live in Boston or San Francisco – I consulted a poorly maintained Google map and spent an afternoon driving around LA, but all I found (as of spring 2015) was a confused convenience store employee who informed me that yes, they used to have a Bitcoin machine. So, I decided to make one myself. 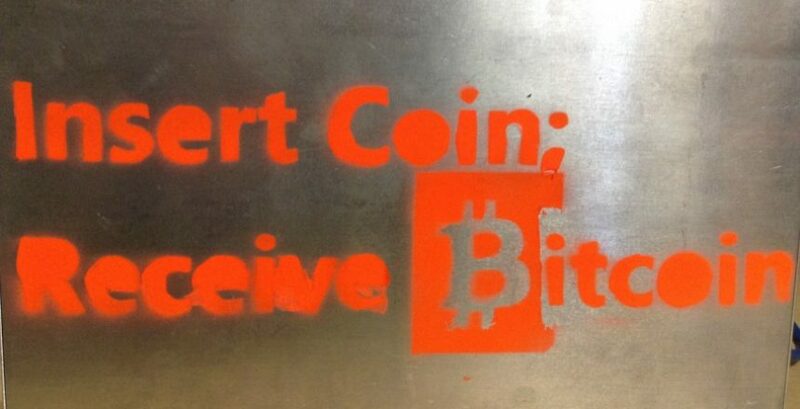 “Insert Coin; Receive Bitcoin.” It’s that simple! The machine generates a new address for your bitcoins and prints the keys on thermal paper. You could scan the QR codes to spend your coins, or just stuff them in your safe and wait to become a millionaire (good luck). Go ahead. Steal my bitcoins. Some may question the utility of paper wallets that store tiny amounts of bitcoin (at the time of writing, 25 cents was worth around 0.001 BTC), but of course that’s not the point. The idea is to take things down a notch; from apocalyptic headlines and cypherpunk gibberish to a piece of paper you can scribble on. To enter the mainstream, Bitcoin needs a sense of humor – not that it wasn’t pretty funny in the first place.